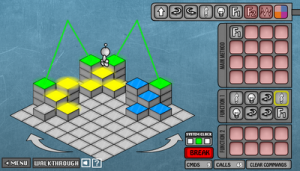 How to play: You can programm the Lightbot to move, jump and to switch its light on. By defining functions and using recursion you can keep your program code small. It's a nice online game where you can start to learn programming. My Record: All Basic and Recursion-Levels done.